When Amy Powney was 10, her parents moved the family from a house in a village in Lancashire to a caravan on a five-acre field with no electricity or running water. Her dad dug a borehole; they erected a wind turbine. Amy and her older sister cut cabbages at six in the morning and saved up their £1.50-an-hour for Reebok Classics and Kappa Poppers to make them look like everyone else, despite the fact that they travelled to school in a handmade trailer attached to the back of their dad’s bike. Flash forward 20-odd years and Powney, 34, is nursing a pink cocktail in the dusky bar of a flash London hotel. She is creative director of the London fashion label Mother of Pearl – as seen at London Fashion Week twice a year and sold in some of the most prestigious stores in the world – having in 12 years worked her way up from the bottom of the company to the top. Last year she married Nick Prendiville, who is a retail consultant, and they live in a beautiful house in Walthamstow, east London, with their puppy. ‘Sustainable but a bit more design-led’: from the No Fills look book. Back in the early years of the new millennium, Powney had charged into her degree course at Kingston University raging about the absolute state the world was in. Having read Naomi Klein’s 1999 anti-consumerism book No Logo, she was determined to do an organic, ethical graduate clothing collection. “My tutors thought I was mad,” she says. ‘My tutors thought I was mad’: from the No Frills look book. But by the time consumers finally started catching up with ethics Powney, now creative director, wasn’t in a position to act according to her values. Mother of Pearl had grown and the demands of fashion retail in a digital world were fierce. “There were too many collections, too much product and me and the staff were really struggling,” she says. A respite came in the form of the 2017 British Fashion Council/Vogue Fashion Fund award, that won the business £100,000. Powney took the opportunity to change the retail sales offering back to twice yearly, giving herself time to work on a passion project called No Frills. Two years later and that core collection of sustainable, ethical, traceable clothing has just gone live. 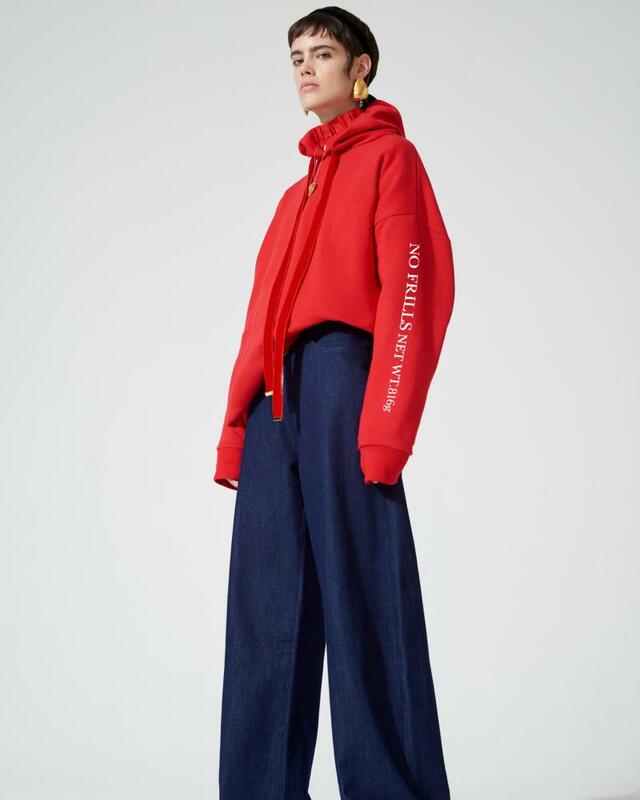 “With No Frills I wanted to be able to say to the consumer, ‘If you’d like to purchase a garment and know where it’s come from, where it’s been, what materials are in it, how it’s been washed and how the people who have worked on it have been treated, we can do that for you,’” she says. Heart on her sleeve: No Frills. The whopping 345-piece core collection – from T-shirts to tailoring – uses Powney’s design signature – feminine, street-influenced and decorative (ironically, featuring a lot of frills as well as pearls) but with sustainability at the fore. Powney has traced her supply chains to alpaca farms in Peru and wool farms in Uruguay, and has sourced her cotton from farms in Turkey. In terms of design, No Frills elevates the ethical clothing choices available now, which tend towards the casual and simple. “I wanted to use good fabrics to bridge the gap between the very T-shirty/denim-type brands and the luxury brands of the world. Could I give the woman something that’s sustainable but a bit more design-led?” Included in the collection are MoP signatures like the Jewel Trouser, now using an ethically sourced denim, and a ruffle blouse from certified organic cotton, as well as a double-breasted tailored trouser suit in soft floral jacquard, made from a blend of organic wool and cotton.